Ever heard the term “creature of habit”? If you look it up on the internet, my photo should be next to the definition. It isn’t, but should be. Routines are comforting to me. I prefer structure over chaos. One side effect is you can almost set a clock by my stomach. Hunger alarms go off at the same time every day. One thing that alters those times are when I’m not eating properly. If I don’t start my day with protein then those hunger alarms get earlier and more frequent plus I’m dragging by mid-morning. 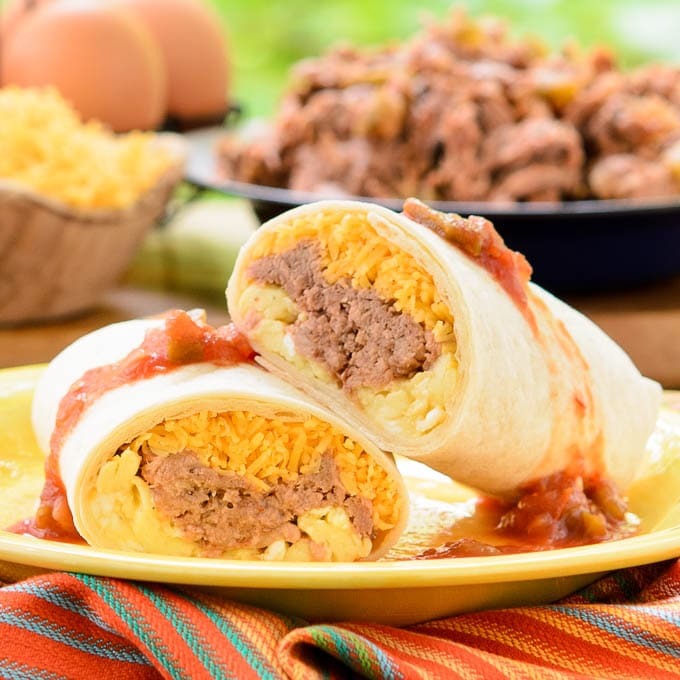 One way I know to kick my day into gear is to make Mexican Shredded Beef Breakfast Burritos. Protein is essential to a healthy eating plan. Beef is an excellent source of it along with many other meats, seafood, nuts, seeds, beans, and dairy. I thought I was getting in enough throughout the day until I started the 30 Day Protein Challenge by the Beef Checkoff. It was then I discovered my breakfast did not include the recommended amount of 25 to 30 grams of protein. I used this handy protein cheat sheet as a resource to make my breakfast protein-packed. About the Mexican Shredded Beef Burritos: It starts with a four ingredient slow-cooker recipe. Onion, garlic, and a beef roast slow-cook for hours. When the meat is fall-apart tender, it is shredded and mixed with your favorite salsa or picante sauce. Chill it for a while to let the flavors infuse with each other. Warm it in the microwave and use it in tacos, enchiladas, burritos and more. One side note about the breakfast burrito: It was my full intention to make one you could freeze and re-heat quickly. I had great success doing it with my Bacon, Egg, and Cheese Breakfast Wraps. Unfortunately, the shredded beef doesn’t re-heat as quickly as the rest of the burrito. By the time the beef is warm, eggs are terribly over-done, cheese is mouth-burning molten, and tortilla is hard as a brick. My Mexican Shredded Beef Breakfast Burritos are best on the day they are made. Join me in taking the 30 Day Protein Challenge. The Beef Checkoff gives lots of information to guide you along the way. You can get started by signing up for a daily motivation email. They also have tools for success including a food journal, hunger scale, and tips for dining out. Sunday Supper is proud to partner with the Beef Checkoff to help you too. Scroll down to find links to recipes for breakfast, lunch, and dinner plus follow the Protein-Packed Recipes Pinterest board. More on The Beef Checkoff: You can follow them on Facebook, Pinterest, Twitter, and their website. 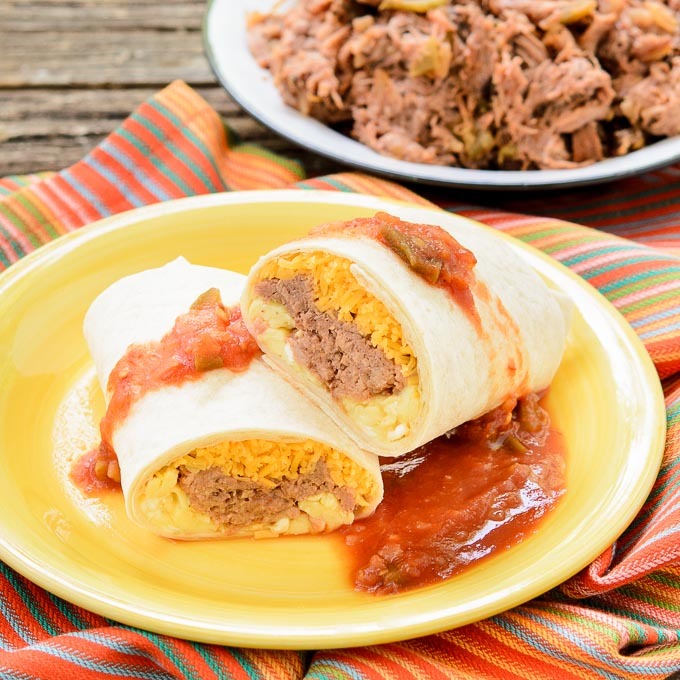 Mexican Shredded Beef Breakfast Burritos is a spicy start the day. They are protein-packed with eggs, cheese, and slow-cooker beef to keep you satisfied. Place onion and garlic in a 3 1/2 to 5 quart slow cooker. Place roast on top. Cover and cook on low for 9 to 10 hours or on high for 5 to 6 hours, or until roast is fork-tender. Remove roast from slow cooker. Shred beef with 2 forks. Discard cooking liquid and onions (or skim and discard the fat from it and save it for another purpose). Combine salsa with shredded beef. Cover and chill for at least 4 hours or overnight. 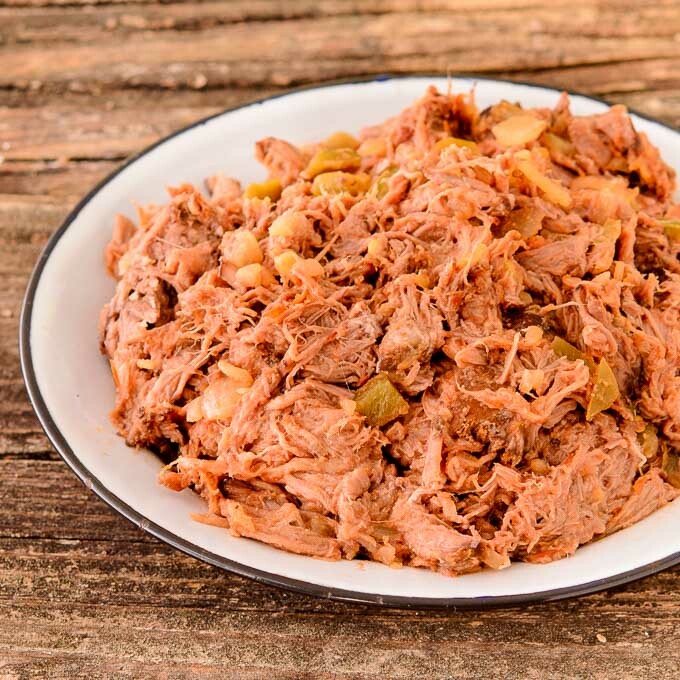 Place 12 ounces of shredded beef in a bowl. Cover loosely with paper towels or parchment paper and microwave until heated through, stirring occasionally. The remaining beef can be frozen to be used for another purpose. Beat eggs, milk, salt, and pepper together in a medium bowl. Pour egg mixture into skillet. Cook eggs, stirring and moving egg mixture around in the skillet to scramble them. Cook until eggs are scrambled and set. Remove from heat. Lay the tortillas out on a work surface. Divide the eggs evenly on top of each tortilla a little off-center. Divide shredded beef evenly and place on top of eggs. Divide cheese evenly and place on top of beef. 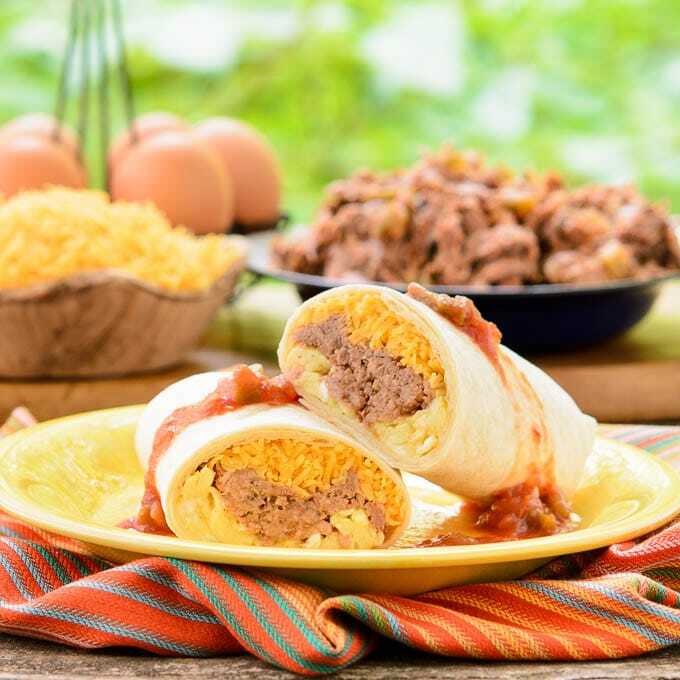 Roll up the tortillas burrito-style by folding the "short" side over the eggs, folding in the sides on top, and rolling to the end of the "long" side. Recipe for Mexican shredded beef adapted from Four-Way Slow Cooker Shredded Beef with Mexican Variation on the Beef It’s What’s For Dinner website. If you like shredded beef, you should also try this version called salpicon! 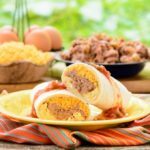 I could eat a huge plate of your shredded beef alone, but incorporating it into a breakfast burrito makes it even more extraordinary! What a terrific idea! Two recipes in one. The shredded beef looks amazing. This is going to be one fantastic breakfast. Oh my gosh yum!! I am so loving this breakfast burrito! It looks amazing and I can only imagine how wonderful it must taste! Your burritos look great! fantastic breakfast idea!! These look fantastic Renee! I would have to take some of that beef for dinner too! Your burrito looks yummy. I am always looking for new breakfast recipes. I was wondering if you mixed the eggs cheese and beef together it and then make your burrito if it would heat better. Mixing the beef, eggs, and cheese together could make it re-heat better (more evenly). I’ll have to give that a try. I wish I had one of these right now! All of these beef recipes are making me hungry. Love how your shredded beef works for any meal, and is so versatile itself! I can totally sink my teeth into this kind of breakfast. Ooh, and you could totally double up the beef you cook, have it for dinner, then make these in the morning! What a great way to use slow cooked beef! My husband would LOVE these!! I love that you went with shredded beef in here! Perfect! 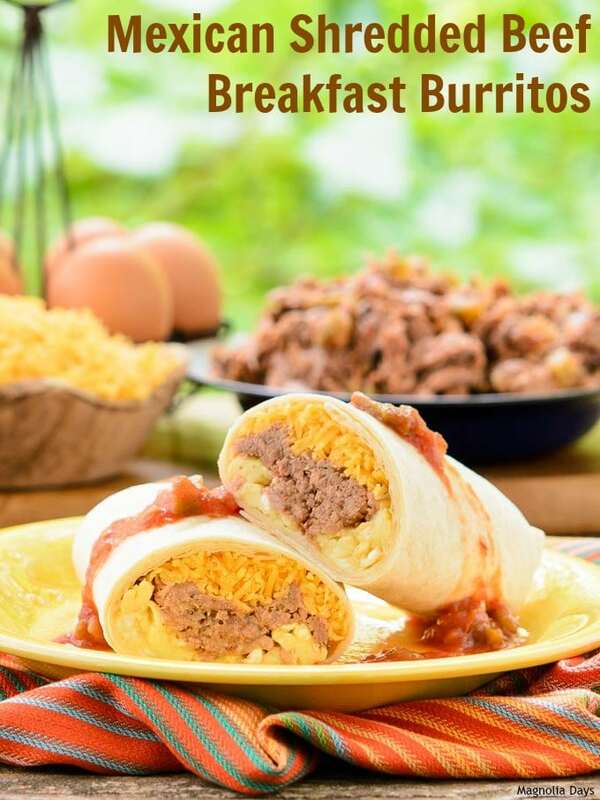 Breakfast Burritos are the kids favorite in our house so I know they will dig into these! These burritos look so good! Bummer that the reheating didn’t work out like you’d hoped. I’m sure these are just delicious when they’re nice and fresh! Every time I look at these photos they make me drool!! I was planning on making some machaca soon and I know what I will be using some of it for!! If you wrap the burrito in a damp/wet paper towel the tortilla won’t dry out. The burrito comes out moist and delicious.